Upavasa (fasting) also means to “reside” (vasa) “nearby” (upa), and thus the real principle of Ekadasi is to reside near Bhagavan. It’s not about fasting; it is about coming closer to the Godhead. Although everyday is God’s day, two days have been singled out as “Hari’s day” to emphasize the point. The hope is that we will then spend these days moving nearer to Bhagavan through Hari-bhakti, and upon finding how relishable these experiences are, we will end up doing them everyday into eternity. This is the idea that our Ekadasi observance should revolve around. If fasting is only making me sleepy or proud, what is the value of it? When I was residing in the Chaitanya Saraswat Math, we would take Ekadasi prasadam on the day of Ekadasi, but there was one devotee from another math residing there who would always observe Nirjala Ekadasi, fasting from all food and water. When the rest of the devotees would sit and take lunch, he would walk near them and chant Harinama very loudly. 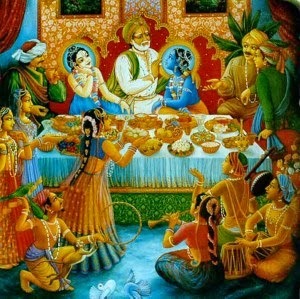 And although he was chanting Harinama, if you listened carefully you could hear, “Just see my standard, you are eating, but I’m observing Nirjala Ekadasi!” His fasting was only fostering his pride, which has no ability to bring us closer to Hari and thereby fulfill the purpose underlying the Ekadasi-vrata. In the same math on another occasion, there was one sannyasi Godbrother of mine visiting, and during the arati he led the kirtan while leaping and dancing in abandon. After the arati he came to take the darshan of Pujyapada Sridhara Maharaja, and in the end of the discussion that ensued, Sridhara Maharaja asked him to please honor Ekadasi prasada. However, the sannyasi replied that for many years he had maintained a vow of fasting from food and drink on Ekadasi. In surprise Sridhara Maharaja said “Leaping high in the air and dancing while leading the kirtan, and observing nirjala at the same time?” Although impressed with his vow, Pujyapada Sridhara Deva asked him again “You will not take anything—no Ekadasi prasada from our math?” To this the sannyasi replied that although this had been his vow for many years, if it would please Sridhara Maharaja then he would break it and honor Mahaprabhu’s prasada. Sridhara Maharaja was very pleased with his response, and whenever he would tell this story he would conclude that “This sannyasi has understood Vaishnavism.” To come closer to the Vaishnava, closer to Bhagavan, this is the purpose of the Ekadasi-vrata. In some instances breaking the law is necessary to observe its spirit. For every law there is a higher law on the way to love, where all law finds its fulfillment. Ekadasi is a particular phase of the moon, which is said to have some influence on fluids—the tides being the prime example. The human body is constituted of water more than any other element, and during Ekadasi it is said that the water in the body shifts in such a way that it puts pressure on the senses, making them more prone to enjoy. Because of this, Ekadasi would seem inauspicious, pressuring our senses to enjoy and thereby impeding our upavasa, or moving closer to Hari. According to this thinking, we fast to counteract the influence of the moon and focus our energy on Bhagavan. Still, Prabhupada said that Ekadasi is “most auspicious,” “it is not about fasting,” and furthermore, “it is about feasting.” But how so? For the siddha, who lives in the aprakrta (transcendent yet humanlike) conception of the Absolute, Krishna is just like us. Yasoda is not thinking that Krishna is the supreme Godhead, and neither are the cowherds or the young gopis. “My son,” “my friend,” “my lover”—they are thinking along these lines. Thinking that Krishna is human, they also think that on Ekadasi there is the same pressure on Krishna’s senses to enjoy more, so they can offer him more on this day. “We can offer more prasadam, we can satisfy his senses more and although we are already giving everything, by the grace of this phase of the moon, he can take even more!” So they increase all their service, and in this way it is a most auspicious day. Of course, they also observe Ekadasi in consideration of the lower perspective in relation to their service to Narayana, their household deity. They observe viddhi (rules) in the context of their raga (loving attachment). We should try to come to this aprakrta conception, to make it our ideal. We should try to serve Krishna so nicely on Ekadasi that our fasting, rather than being an austerity, is merely the result of having no time to eat because we are so busy serving his senses.